I had not actually planned to write anything this week because someone said that the world was going to end on Saturday. And so this week I present a collection of papers on the factors that shape the box office performance of films. The majority of these papers are the final versions from university research depositories, but some may be pre-prints or drafts so check before you cite. The best place to start is undoubtedly this paper from Jehoshua Eliashberg, Anita Elberse, and Mark A.A.M. Leenders from 2006, which provides a summary of research in this area and illustrates the type of research carried out in the fields of economics, retailing, and marketing that is entirely absent from film studies texts. Eliashberg J, Elberse A, and Leenders MAAM 2006 The motion picture industry: critical issues in practice, current research, and new research directions, Marketing Sceince 25 (6): 638-661. The motion picture industry has provided a fruitful research domain for scholars in marketing and other disciplines. The industry has high economic importance and is appealing to researchers because it offers both rich data that cover the entire product lifecycle for many new products and because it provides many unsolved “puzzles.” Although the amount of scholarly research in this area is rapidly growing, its impact on practice has not been as significant as in other industries (e.g., consumer packaged goods). In this article, we discuss critical practical issues for the motion picture industry, review existing knowledge on those issues, and outline promising research directions. Our review is organized around the three key stages in the value chain for theatrical motion pictures: production, distribution, and exhibition. Focusing on what we believe are critical managerial issues, we propose various conjectures—framed either as research challenges or specific research hypotheses—related to each stage in the value chain and often involved in understanding consumer moviegoing behavior. Basuroy S, Chetterjee S, and Ravid SA 2003 How critical are critical reviews? The box office effects of film critics, star power, and budgets, Journal of Marketing 67 (4): 103-117. The authors investigate how critics affect the box office performance of films and how the effects may be moderated by stars and budgets. The authors examine the process through which critics affect box office revenue, that is, whether they influence the decision of the film going public (their role as influencers), merely predict the decision (their role as predictors), or do both. They find that both positive and negative reviews are correlated with weekly box office revenue over an eight-week period, suggesting that critics play a dual role: They can influence and predict box office revenue. However, the authors find the impact of negative reviews (but not positive reviews) to diminish over time, a pattern that is more consistent with critics’ role as influencers. The authors then compare the positive impact of good reviews with the negative impact of bad reviews to find that film reviews evidence a negativity bias; that is, negative reviews hurt performance more than positive reviews help performance, but only during the first week of a film’s run. Finally, the authors examine two key moderators of critical reviews, stars and budgets, and find that popular stars and big budgets enhance box office revenue for films that receive more negative critical reviews than positive critical reviews but do little for films that receive more positive reviews than negative reviews. Taken together, the findings not only replicate and extend prior research on critical reviews and box office performance but also offer insight into how film studios can strategically manage the review process to enhance box office revenue. The web page of Suman Basuroy at The University of Oklahoma is here, and has links to his many papers on the marketing of motion pictures. Craig S, Douglas S, and Greene W 2003 Culture matters: a hierarchical linear random parameters model for predicting success of US films in foreign markets, Manuscript, Department of Marketing, Stern School of Business, NYU. Culture matters in ways that are salient for products with significant cultural content. In particular, the cultural context in which a product is launched plays an important role in its success. The present study examines the impact of cultural context on the box office performance of US films in foreign markets. A hierarchical linear random parameters model is used to assess the impact of national culture, degree of Americanization, US box office and film genre on performance in eight foreign markets. The model allowed for film-specific heterogeneity to be accounted for and for hypotheses to be tested at both the film level and the country level. Results indicate that films perform better in countries that are culturally closer to the US and those that have a higher degree of Americanization. The genre of the film and US box office success also had a significant impact on performance. Some implications are drawn for managers releasing films in foreign markets. Dellarocas C, Farag NA, and Zhang X 2005 Using online ratings as a proxy of word-of-mouth in motion picture revenue forecasting, SSRN Working Paper. The emergence of online product review forums has enabled firms to monitor consumer opinions about their products in real-time by mining publicly available information from the Internet. This paper studies the value of online product ratings in revenue forecasting of new experience goods. Our objective is to understand what metrics of online ratings are the most informative indicators of a product’s future sales and how the explanatory power of such metrics compares to that of other variables that have traditionally been used for similar purposes in the past. We focus our attention on online movie ratings and incorporate our findings into practical motion picture revenue forecasting models that use very early (opening weekend) box office and movie ratings data to generate remarkably accurate forecasts of a movie’s future revenue trajectory. Among the metrics of online ratings we considered, we found the valence of user ratings to be the most significant explanatory variable. The gender diversity of online raters was also significant, supporting the theory that word-of-mouth that is more widely dispersed among different social groups is more effective. Interestingly, our analysis found user ratings to be more influential in predicting future revenues than average professional critic reviews. Overall, our study has established that online ratings are a useful source of information about a movie’s long-term prospects, enabling exhibitors and distributors to obtain revenue forecasts of a given accuracy sooner than with older techniques. 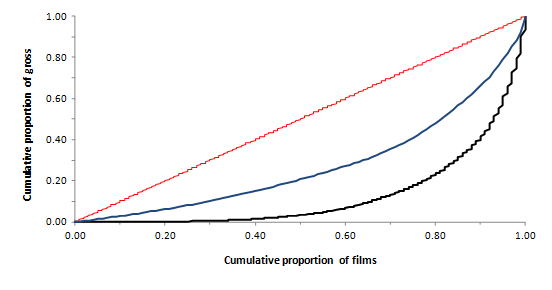 Elberse A 2007 The power of stars: do star actors drive the success of movies?, Journal of Marketing 71 (4): 102-120. Is the involvement of stars critical to the success of motion pictures? Film studios, which regularly pay multimillion-dollar fees to stars, seem to be driven by that belief. This article sheds light on the returns on this investment using an event study that considers the impact of more than 1200 casting announcements on trading behavior in a simulated and real stock market setting. The author finds evidence that the involvement of stars affects movies’ expected theatrical revenues and provides insight into the magnitude of this effect. For example, the estimates suggest that, on average, stars are worth approximately $3 million in theatrical revenues. In a cross-sectional analysis grounded in the literature on group dynamics, the author also examines the determinants of the magnitude of stars’ impact on expected revenues. Among other things, the author shows that the stronger a cast already is, the greater is the impact of a newly recruited star with a track record of box office successes or with a strong artistic reputation. Finally, in an extension to the study, the author does not find that the involvement of stars in movies increases the valuation of film companies that release the movies, thus providing insufficient grounds to conclude that stars add more value than they capture. The author discusses implications for managers in the motion picture industry. Elliot C and Simmons R 2007 Determinants of UK Box Office Success: The Impact of Quality Signals, Lancaster University Management School Working Paper 2007/012. This paper analyses the roles of various potential quality signals in the demand for cinema in the United Kingdom using a breakdown of advertising totals by media category. 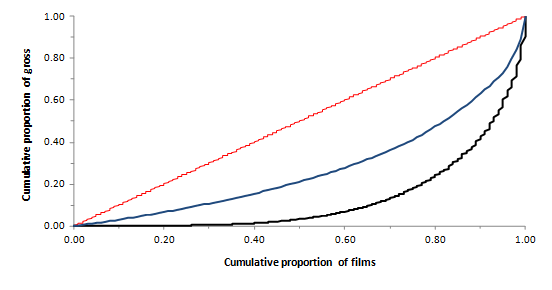 Estimation of a two stage least squares model with data for 546 films released in the United Kingdom shows that the impacts of types of advertising on box office revenues vary both in channels and magnitudes of impact. We also offer a more sophisticated treatment of critical reviews than hitherto by examining the spread (entropy) rather than just the mean rating. Hennig-Thurau T, Houston MB, Sridhar S 2006 Can good marketing carry a bad product? Evidence from the motion picture industry, Marketing Letters 17 (3): 205-219. We examine the relative roles of marketing actions and product quality in determining commercial success. Using the motion picture context, in which product quality is difficult for consumers to anticipate and information on product success is available for different points in time, we model the effects of studio actions and movie quality on a movie’s sales during different phases of its theatrical run. For a sample of 331 recent motion pictures, structural equation modeling demonstrates that studio actions primarily influence early box office results, whereas movie quality influences both short- and long-term theatrical outcomes. The core results are robust across moderating conditions. We identify two data segments with follow-up latent class regressions and explore the degree of studio actions needed to “save” movies of varying quality.We finally offer some implications for research and management. Hennig-Thurau T, Walsh G, and Bode M 2004 Exporting media products: understanding the success and failure of hollywood movies in Germany, Advances in Consumer Research 31 (1): 633-638. Rising production costs in the US motion picture industry make overseas markets essential for movie studios’ economic survival. However, movie marketers can rarely build on systematic research when attempting to customize movies or movie-related communications to different cultural settings. In this paper, we draw from cultural theory to develop a conceptual framework of US movies’ success in foreign markets. Propositions are then developed that offer insight into the differing impact of a number of factors on movie success in the US and Germany. Marketing implications will be discussed. The webpage for Thorsten Hennig-Thurau at the Cass Business School is here. Sharda R and Delen D 2006 Predicting box-office success of motion pictures with neural networks, Expert Systems with Applications 30 (2): 243-254. [NB: although there is no specific URL associated with it, there is a downloadable version of this paper which you will find if your search for the title in Google Scholar]. Predicting box-office receipts of a particular motion picture has intrigued many scholars and industry leaders as a difficult and challenging problem. 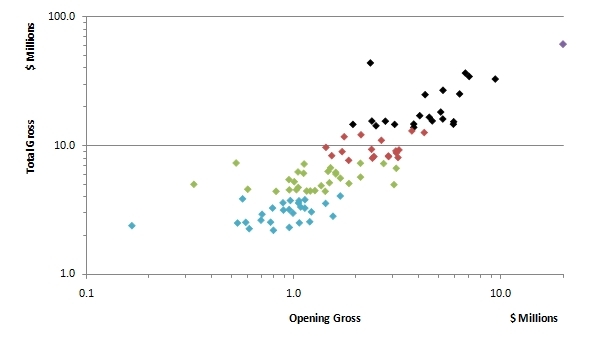 In this study, the use of neural networks in predicting the financial performance of a movie at the box-office before its theatrical release is explored. 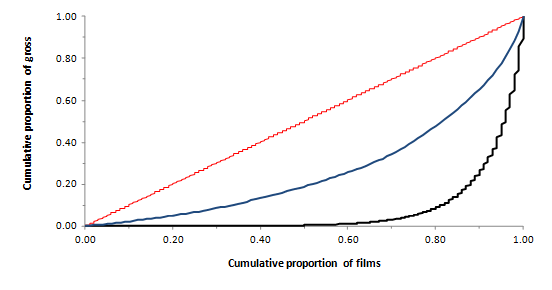 In our model, the forecasting problem is converted into a classification problem-rather than forecasting the point estimate of box-office receipts, a movie based on its box-office receipts in one of nine categories is classified, ranging from a ‘flop’ to a ‘blockbuster.’ Because our model is designed to predict the expected revenue range of a movie before its theatrical release, it can be used as a powerful decision aid by studios, distributors, and exhibitors. Our prediction results is presented using two performance measures: average percent success rate of classifying a movie’s success exactly, or within one class of its actual performance. Comparison of our neural network to models proposed in the recent literature as well as other statistical techniques using a 10-fold cross validation methodology shows that the neural networks do a much better job of predicting in this setting. Terry N, Butler M, and De’Armond D 2005 The determinants of domestic box office performance in the motion picture industry, Southwestern Economic Review 32: 137-148. This paper examines the determinants of box office revenue in the motion picture industry. The sample consists of 505 films released during 2001-2003. Regression results indicate the primary determinants of box office earnings are critic reviews, award nominations, sequels, Motion Picture Association of America rating, budget, and release exposure. Specific results include the observation that a ten percent increase in critical approval garners an extra seven million dollars at the box office, an academy award nomination is worth six million dollars, the built in audience from sequels are worth eighteen million dollars, and R-rated movies are penalized twelve million dollars. In some earlier posts I looked at the clustering of films at the UK box office based on their opening and total grosses from 2007 to 2009: see here and here. This post updates the UK data to include the top 100 films at the UK box office in 2010, and also looks at the top 100 in France and Germany in the same year. 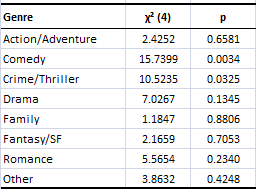 Data on the total and opening weekend (including previews) box office gross was collected from Box Office Mojo. Gross data on Box Office Mojo is given in US dollars, and – unless otherwise stated – to make direct comparisons between the different countries I have left this as it is and have not corrected the data to pounds and Euros. (To compare this UK data to that in earlier posts it is necessary to multiply the box office gross in US dollars by 0.65 to convert to pounds). To sort the data into groups, the opening weekend gross (including previews) and the total box office data were entered into PAST (v. 2.06) and then allocated by using k-means clustering into 5 groups. Data was missing for some films so the plots do not actually include the top 100 for each country: 3 films are missing for the UK data, four from Germany, and 2 from France. 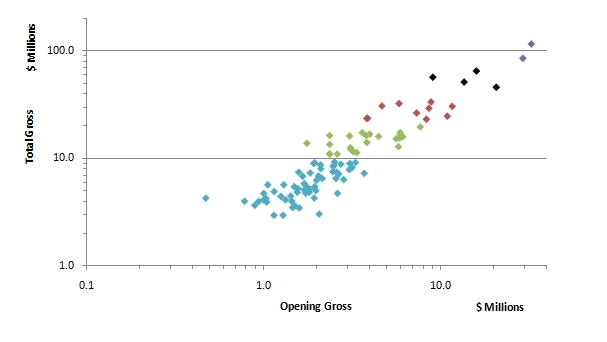 It is clear from the data in Figures 1 through 3, that there is a strong correlation between the opening weekend gross of a film and its total box office revenue in all countries. The Spearman rank correlation for the UK is rs (95) = 0.8988, p = <0.0001. For Germany, rs (94) = 0.8537, p = < 0.0001; and for France rs (96) = 0.8991, p = <0.0001. In the UK the mean proportion of a film’s total gross accounted for by its opening weekend is 0.30 (95% CI: 0.28, 0.32). For Germany, the mean proportion is 0.27 (95% CI: 0.25, 0.29); and for France it is 0.34 (95% CI: 0.32, 0.37). This indicates that the opening weekend in France is a stronger predictor of overall box office gross in France than in Germany or the UK, though not by much. The UK data is presented in Figure 1, and looks very like the plots of the box office grosses from earlier posts covering the period 2007 to 2009. We have two films (Toy Story 3 and Harry Potter and the Deathly Hallows (Part One)) that easily outperformed everything else. The black cluster includes four films (Alice in Wonderland, Inception, Shrek Forever After, The Twilight Saga: Eclipse) that are what we would expect to see in this part of the graph: they are the big budget Hollywood movies that dominate the UK box office. Note that four of the top six films are franchise movies. The red cluster is made up of 10 Hollywood films (e.g. Robin Hood, Iron Man 2, Little Fockers) that probably disappointed a little; British audiences are possibly a little tired on non-English Robin Hood’s (comedians have even stopped making jokes about the fact that he is never English) and they don’t appear to be over-enthusiastic about the Iron Man films. The character of Iron Man doesn’t have the same resonance with non-comic book readers as a Spiderman, Superman, or Batman, and so the premium derived from the prior source material is not as evident. It will therefore be interesting to see what happens to Green Lantern when it opens here on 17 June 2011, as this also does not have any major resonance for UK audiences – the best the producers may be able to expect is a red cluster rather than a black cluster film. The green group is also composed entirely of Hollywood films, with no UK films (other than those produced with US studios) making it into the top 40. This suggests that 2010 was a bad year for British cinema (if we don’t include Hollywood blockbusters as British). In fact, the green group is largely made up of Hollywood stinkers: Knight & Day, The A-Team, Tron Legacy, and The Expendables. The blue group contains 58 films, none of which grossed over $9.3 million ($6 million), and is the usual mixture of British films that made it into the Top 100 (Made In Dagenham, Tamara Drewe) and Hollywood films that performed very poorly (The Book of Eli, The Blind Side, The Last Airbender). The Book of Eli performed poorly in all three countries: it was the 64th highest grossing film in the UK, but only achieved a rank of 80 in Germany and 84 in France. The mean gross values for the different UK clusters in US dollars and pounds is presented in Table 1. 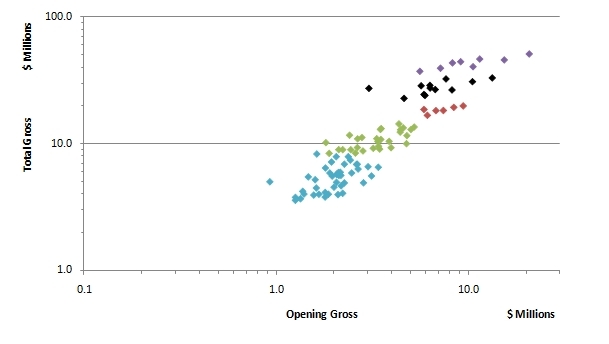 Note also that dividing the opening weekend gross of a cluster by the cluster above it (e.g. purple/black) is approximately 0.5. This is also true for the total grosses, except when dividing the total gross for the blue cluster by the green cluster, which produces a ratio of 0.4. 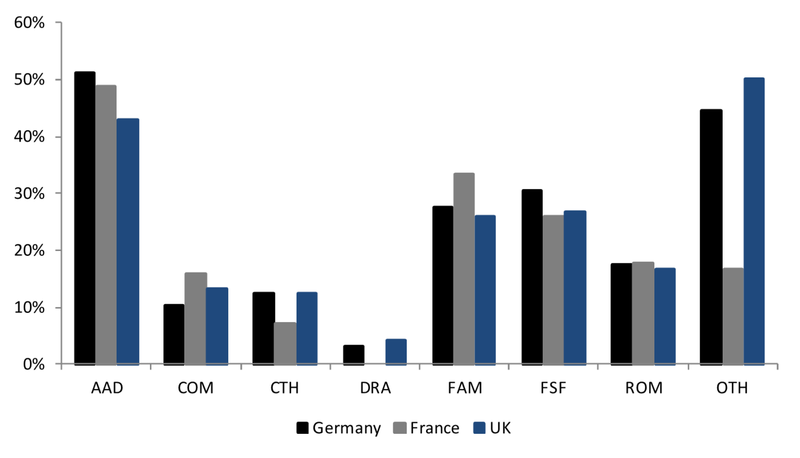 Turning to the data for Germany (Figure 2) and France (Figure 3), we see that the same clear pattern evident in the UK is not present. The clustering is fair less satisfactory (I have not altered the clustering produced by the software in the graphs used here). In part, this is because I am using the same approach of clustering into 5 groups that I used for the UK, and there is no reason to think that the clustering in on country should apply in another – in fact it’s fairly obvious from looking at Figures 1 and 3, that if we are going to use 5 clusters for the UK box office data we would be better off using four (or even three) for the top 100 films in France. Germany is probably OK with 5 clusters, but I think that the clustering results presented here could be improved by reclustering the data from the black and red groups to give a better breakdown. That said, it is nonetheless instructive to see how these two countries differ from the UK by using the method in all cases. In Germany, Harry Potter and the Deathly Hallows (Part One) clearly outperformed every other film by some distance, but the differences between the other clusters are not so clearly marked as they are in the UK.The black cluster looks like it could be broken into two groups, with the 7 highest grossing films forming a single group while the remainder look as though they belong with the red cluster. The 7 highest grossing films in the black group all grossed ore than $24 million, while the remainder grossed between $18 and $13 million. These 7 films include franchise movies like Shrek Forever After and The Twilight Saga: Eclipse, along with blockbusters like Alice in Wonderland and Inception – but NOT Toy Story 3. The other 14 black films include big Hollywood films like Clash of the Titans, Sherlock Holmes, and Robin Hood; but also, and unlike in the UK and France where their performance was poor, Resident Evil: Afterlife and The Last Airbender. Included in the black group is Konferenz der Tiere, which at 20, is the highest ranked German film – its animated film released in English as Animals United. The red cluster is made up of the same type of films as the lower 14 black films – the type of Hollywood films that dominate the box office charts of Europe (Iron Man 2, Knight & Day, The Expendables). German film titles start to make more frequent appearances once we get to the green group (e.g Vincent will Meer, Zeiten ändern Dich, Groupies bleiben nicht zum Frühstück), and there are also some big Hollywood films that have badly underperformed (The A-Team). In France, the data shows less variation in both the total and opening weekend grosses than the other countries. The purple cluster contains a more films (8) than in any of the other countries or years looked at in this or the other posts. Six of these films are the same top 6 we saw in the UK, along with Les petits mouchoirs and L’arnacoeur. The red group looks at little lost, and could perhaps be included with the black cluster. Included in this group are films such as Iron Man 2, Knight & Day, Clash of the Titans, Sherlock Holmes, Robin Hood, and other Hollywood films that appear to have opened reasonably well, but which have perhaps underperformed in terms of their overall box office gross – hence the separation from the black cluster. The difference between the green and blue clusters in France is not clear-cut, and could realistically be placed within a single group. These groups contain a mixture of yet again failing Hollywood films (The A-Team, Knight & Day) and French films that become increasingly more frequent once we get to these last two groups. It is interesting to compare different European countries in this way because you can see where the variations in audience taste lie: Germans were apparently eager to watch the latest Resident Evil film, whereas the French and the British were not. There were less inclined to go and see Toy Story 3, unlike the French who enjoyed the film in large numbers and the British who made this film the highest grossing film of the year by some way. You can also find the similarities: for example, everybody hated Letters to Juliet – it ranked 94th in Germany, 100th in the UK, and still hasn’t been released in France. Earlier posts have looked at shot scales in Hollywood and German cinema (here and here), and the films of Max Ophüls (here) and Alfred Hitchcock (here). This post follows those up with a quick look at French cinema of the 1920s using data from Barry Salt’s database (which can be accessed here). The mean relative frequencies for a sample of 18 silent French films released between 1920 and 1929 (inclusive) are presented in Table 1, and Figure 1 is the rank-frequency plot for this data. The slope of the linear trendline in Figure 1 is -0.0456 (95% CI: -0.0682, -0.0231) and the intercept is 0.3254 (95% CI: 0.2245, 0.4263). 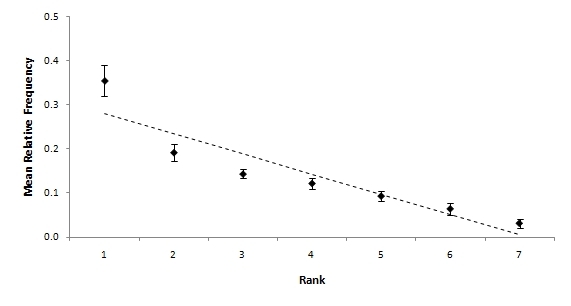 From Figure 1 it is clear that this trendline is a poor fit for this data (R² = 0.8440, SE = 0.0464). Exponential (R² = 0.9580) and logarithmic (R² = 0.9685) trendlines give a better fit. Figure 1 Rank-frequency plot of shot scales for French cinema of the 1920s (n = 18). The error bars are the 95% confidence interval. 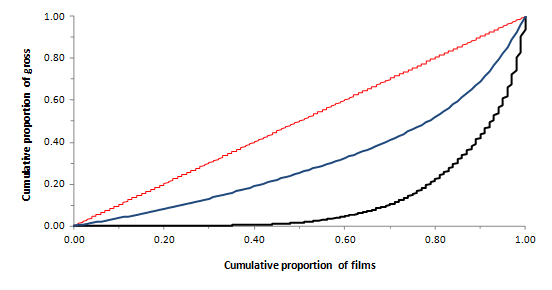 Comparing these results with those of 1920s Hollywood cinema and German cinema (available here), we can see that the poor fit for the linear trendline French cinema is consistent with German films (R² = 0.8606, SE = 0.0505) but different from Hollywood cinema (R² = 0.9902, SE = 0.0106). Like German cinema of the 1920s, a single shot scale dominates the style of these films while other shot scales occur much less frequently. 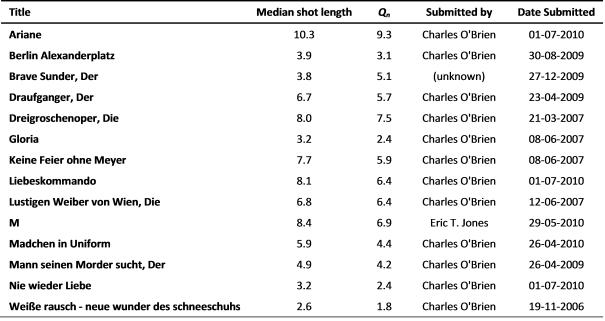 For German films of the 1920s the mean relative frequency for the first-ranked shot scale is 0.3804 (95% CI: 0.3181, 0.4428) – an estimate that is clearly in line with that of the French films described here. By contrast, the equivalent figure for Hollywood in the 190s is 0.2967 (95% CI: 0.2697, 0.3166). Elsewhere I have argued that the change evident in the rank-frequency plots for Hollywood cinema occurs with the introduction of continuity editing and the change representation of on-screen space in the classical style. We may infer from these results that 1920s French cinema did not break down space in the same way as contemporary Hollywood films, and that they held onto the same pre-classical style as German filmmakers. The dominance of a single scale in French cinema is evident in the summary given in Table 2 and in Figure 2. The long shot is the first-ranked scale in 17 of the 18 films included in the sample; and for the only film where this is not so, the medium long shot is the most frequently occurring. Although Barry Salt’s data on shot scales does include many French films of the 1930s, it covers a narrower range of directors than for the 1920s (which is useful in different ways), and so any analysis for this period will reflect that limitation rather than a broader historical style. We cannot be certain that, as in Germany, the French cinema went over to a classical Hollywood style in the 1930s, but it is worthy of further research. to determine if there is a European-wide lag in the take-up of Hollywood’s style or if this true only for some countries. Interestingly, Hitchcock’s British films of this period are consistent with Hollywood cinema in this respect. 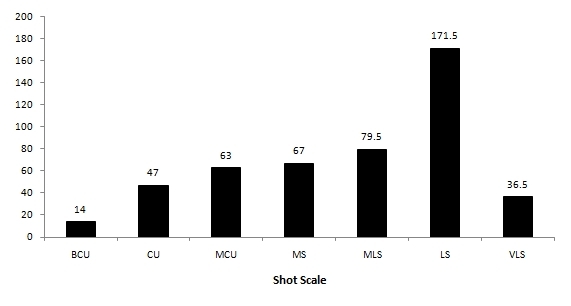 Figure 2 Normalized sample medians of shot scales in French cinema of the 1920s. This week’s post presents a first draft of a piece on shot scales in Hollywood and German cinema from the 1910s to the 1930s. 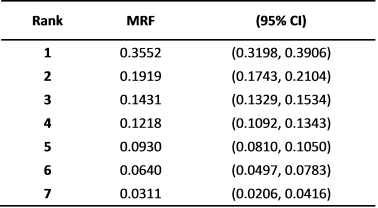 The methods applied have been discussed on this blog before, but this paper presents a more systematic use of a regression than has previously been the case. The file is available as a pdf here: Nick Redfern – Shot scales in Hollywood and German cinema, 1910 to 1939, and the abstract is presented below. Statistical analysis is an important part of an inductive programme of research into film style enabling large groups of films to be analysed, identifying key trends, and identifying changes in film style between groups of films from different countries and time periods. In this paper, the use of shot scales in Hollywood and German cinema between 1910 and 1939 is analysed using linear regression of rank-frequency plots and nonparametric analysis of variance. 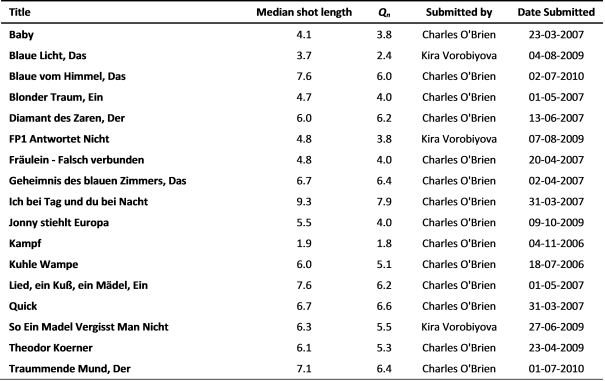 The results show that Hollywood and German cinema underwent a similar change in the use of shot scales but that this change occurred at different times. The shift from a non-linear to a linear distribution of mean relative frequencies and the increased use of close-ups and medium close-ups for Hollywood cinema in the 1920s may be explained by formal and stylistic changes as the ‘classical’ Hollywood cinema superseded a more ‘primitive’ style, with the analysis of space through continuity editing replacing the distant framing and staging of an earlier film style. A similar change occurs in the style of German films but not until the 1930s, and this supports the argument that the development of film style in German cinema was influenced by that of Hollywood. The results of this paper demonstrate what a simple and effective method the use of linear regression of rank-frequency plots can be: changes in film style over time and differences in nation style between Hollywood and German cinema were identified precisley where historical research said they should be. I still haven’t solved the problem of the most consistent model from a nonlinear distribution of the mean relative frequencies of shot scales. One possibility suggested by the results presented here is that different models may work for different periods or groups of films. The same also goes for German cinema. Feel free to point out any typing errors (I am the world’s worst typist). Any suggestions on further research or where to get this published are also welcome. UPDATE (5/10/2010): This file has been updated to correct a really obvious error in the presentation of the results, but is otherwise unchanged.